Tell us about you and your growing family. We are an active two business, two-mom and two-kid family. Evelyn Rose is 2 months old and Violette is 6 ½ years old. We are very involved in our community, and also happen to live and run an urban farm! What came first, the idea behind Farmhouse Delivery or Rain Lily Farm? First came Rain Lily Design and Landscaping and our love of growing plants in the tough environs of central Texas. Rain Lilies are actually really tough, really beautiful little bulbs that take advantage of our sometimes sparse rains, by blooming right after a rain. Purchasing our home and all the land came next, followed by the farm – we went a bit over board with all of our land, and couldn’t stop growing things! 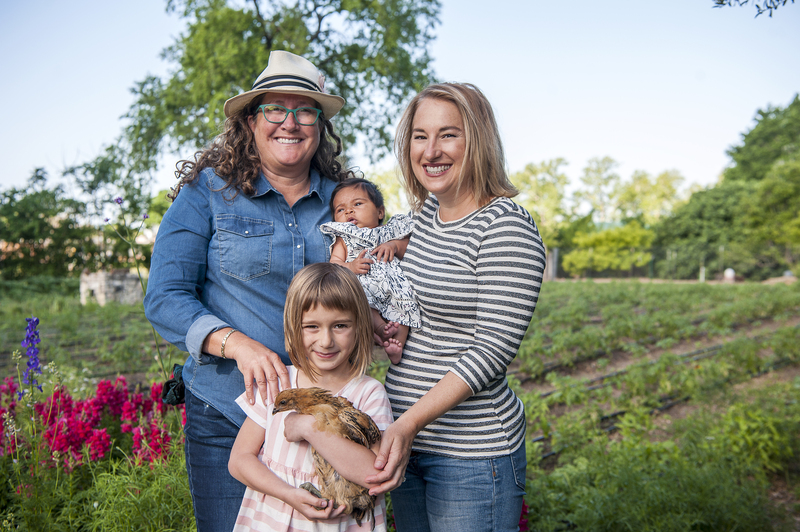 After working all week, farming after work then going to farmers markets on weekends, we realized that local small farmers needed help with sales and distribution and Farmhouse was born. What was the inspiration behind Farmhouse Delivery? We had such an abundance of produce from Rain Lily Farm that we couldn’t consume it all ourselves. 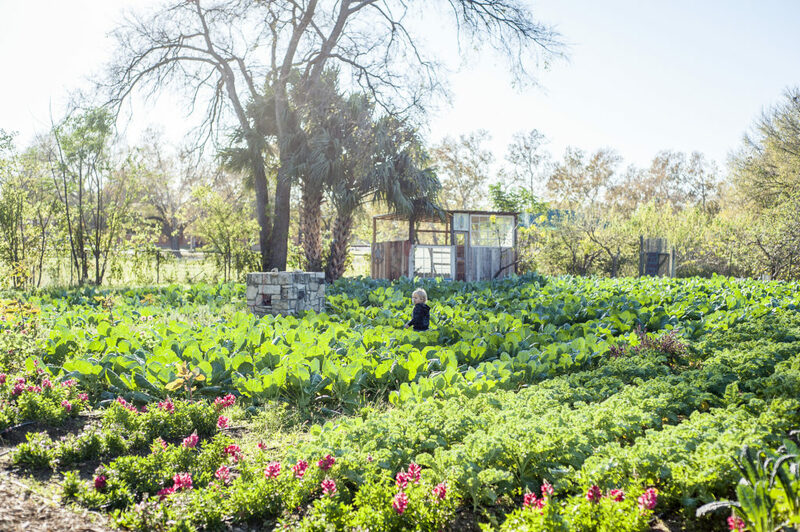 Farmhouse was started in order to find a way to share in the abundance as well as help the community connect and understand where their food comes from. Tell us briefly about your background. Do you come from a farming and agriculture family or are you a self-taught farmer/entrepreneur? We actually both come from farming families in our grandparents and great grandparents generation- my (Kim’s) family from the Hilsboro/Whitney area of north Texas, and Steph’s family near Swanton Ohio. It skipped our parents, but obviously didn’t leave our families. We are both the first entrepreneurs in our families, though for sure. I knew that I wanted to have my own business pertaining to plants when I was in high school. It just took some job experience at the Natural Gardener in Austin, after UT, to make what kind of work clear. Your family has recently welcomed a new member, Evenlyn Rose, in addition to big sis Violette. Congrats! How does your family plan to balance running a farm, business, landscape design firm, and your relationship with two young girls? Divide and conquer! I am so lucky to have the most amazing team at Rain Lily Design and Landscaping so, I am able to work part time, and be there for Evelyn most days and Violette after school. Steph works full time at Farmhouse Delivery and runs the farm with the help of our landscape team. Owning businesses mean we work, kind of all the time, but we also often have the flexibility of when and where that is so it helps with young kids. Violette walked around pointing at plants, giving inaudible instructions to imaginary employees at age 2 so, I think we are showing our girls great examples of how to be a great boss! Let’s talk kids and veggies. Any tips of making veggies fun or getting your kids to eat more of them? The best tip is grow it and let them pick – they will eat anything – our daughter eats raw kale!! Rain Lily design can help with this, we help set up veggie gardens for lots of clients, and even maintain some for folks who have really hectic work schedules with lots of traveling. I also used to let Violette unpack our farmhouse bushel. She ‘tasted’ every veggie she took out, plus she had fun. We had little toddler teeth marks on our squash and such, but it was so much fun for us both! What does an ideal day on the farm look like? 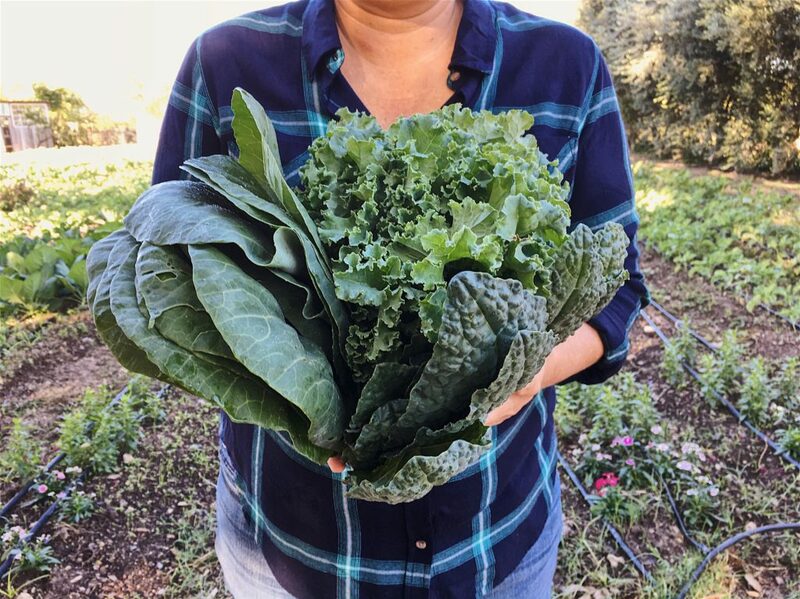 We love for Violette to help round up chickens that have gotten loose, and we often send her out to pick our salad for dinner (one of her top food choices- crazy! ), which she has a lot of pride in. I seeded squash and melons in the greenhouse with Evelyn Rose in the baby carrier two weekends ago! I plan on starting a small garden, a few steps from our back door for Violette and I, that is just ours to water and care for. We also love to have events like Shakespeare on the Farm. Some of my happiest memories are chasing toddler Violette around the farm while she watches actors stretching and doing vocal exercises – she started stretching with them! What do you love about raising your family on a farm? I think there are a lot of lessons learned in nature, and in having space to run around outside; observing, getting fresh air, moving your body. I love getting to watch kids pick fresh healthy food, hold baby chicks and even notice feathers indicating a bird may not have survived a raccoon’s determination. Violette is also a flower junkie and loves picking bouquets! When did you know that adoption was the right choice for your family? We knew the decision was right after taking a free information workshop on adoption. It is put on twice a year by Adoption Advocates, and is very informative. They go over the assumptions and myths that most people have about adoption (and we had without knowing), and they have people from each part of the adoption triad speak and answer questions. So, we got to hear from birth moms, adoptive families and even children that were in open adoptions. The key for us was an open adoption, as we had close friends that were products of closed adoptions, and we were able to see that side of things, and the benefits for the child of an open relationship, and an understanding of all parts of themselves – biology and biography. Any advice for families who are considering adoption? I think digging in to the adoption community before you decide is key – taking a class, speaking with adoption agencies and other adoptive parents. There is a really big adoption community out there. For us, having a really great agency that took the best care possible of all three sides of the adoption triad was really important. They really set all of us up for success. They hold ongoing support groups for adoptive parents many varied topics like, being a biracial family. Just like anything in life, don’t go it alone- get support and information. What’s next for Farmhouse Delivery and Rain Lily Farm? Farmhouse Delivery remains focused on continuing to grow within Texas, bringing Texans the freshest local produce, meal kits, and groceries. Our aim is to build a strong local food community by connecting our members to the farmers, ranchers and artisans who produce their food. Rain Lily Farm will keep plugging away for foreseeable future, and Rain Lily Landscape will too! Rain Lily Landscape will continue focusing on water wise solutions like rain gardens. About Rain Lily Farm and Farmhouse Delivery: Rain Lily Farm offers educational experiences to the public from farming and cooking classes to school tours in order to help motivate healthy and sustainable food practices while Farmhouse Delivery brings local produce, meat, dairy and artisan groceries, produce boxes, and freshly prepared meal kits directly to your doorstep. Such a forward thinking and hard working fam! So impressed and inspired.